Cooler weather and the beautiful colors of Fall are upon us. Jeff loves this time of year because I'm in the kitchen baking whenever I have the chance. Maybe the lower temps increase my appetite. This month's recipes come from a new favorite blogger and some Food Network quick bread ingredients ideas from one of my recent bake-a-thons in the kitchen. Renowned chef and author Peter Reinhart has published his latest book: Bread Revolution. 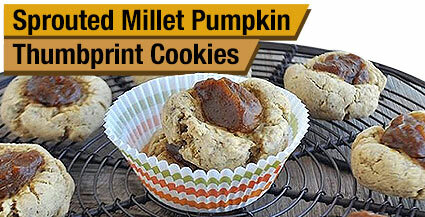 It's full of fabulous recipes formulated for baking with sprouted flours. Peter has included one of my recipes and an interview with us during a visit last spring. We will have Peter's book available on our web site when it's released on October 21st, or you can pre-order it now on Amazon.com. 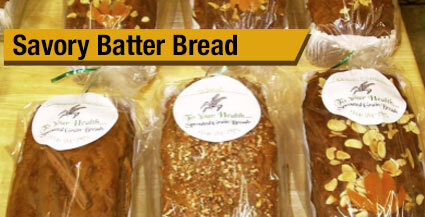 http://www.simplysproutedsnacks.com was picked as one of the top five products at Expo East in Baltimore last month. Max Goldberg of Living Maxwell reviews the top 5 with Food Babe Vani Hari. The Girls now offer an 8 oz. bag in addition to their 16 oz. bag. Sara, the organic dietitian, http://www.theorganicdietitian.com recently posted this great recipe for all of you who are going gluten, dairy, and egg-free for a while. Preheat oven to 375 degrees. In mixing bowl add flour, baking soda, salt and 1 tsp. pumpkin pie spice. Mix to combine. Add vanilla, coconut oil, maple syrup, milk, and egg. Mix to combine. The dough will be thick and soft almost like play doh. Scoop 1 tablespoon of dough and roll it into a ball with your hands. Place on parchment-lined cookie sheets. With your thumb lightly press down into the cookie to form a bowl for the topping. Repeat with remainder of dough. Place on sheets 1/2" apart. In a blender add the pumpkin puree, dates, and 1/2 tsp. pumpkin pie spice. Blend until smooth and thick (add a couple tbsp. water if needed to get the blender going). Spoon 1-2 teaspoons of the pumpkin date mixture into each thumb bowl. Bake for 15-18 minutes until firm. Remove from oven and cool on wire rack. Store in airtight container for 5-7 days. Makes about 3 dozen cookies. Click to download a PDF version of this recipe. This is my original sprouted bread recipe, but with a fabulous new variation. I got the inspiration from the Food Network, my go-to TV station. Preheat oven to 350 degrees. In large bowl mix flour and buttermilk until blended. Thoroughly mix in remaining ingredients. If batter is dry add buttermilk, 2 tbsps. at a time, until batter is stirrable, but not thin. Pour batter into a well buttered (use bacon grease if adding crumbled bacon) and floured 9"x5" loaf pan or 3 mini loaf pans. Bake for 1 hour and 20 minutes (about 1 hour if using mini loaf pans) or until a toothpick inserted into center of loaf comes out clean. Remove from oven and cool for 10 minutes. Remove from pan and continue to cool on wire rack. A great sweet treat that's fast and easy to make. I prefer them plain. In mixing bowl, cream togther butter and sugar. Add egg and vanilla. Blend well. Add remaining ingredients and blend well. Drop by tablespoonfuls onto a parchment-lined cookie sheet. Bake about 15 minutes until lightly browned on edges. Remove from oven and cool on wire rack.